This astronomy calendar of celestial events contains dates for notable celestial events including moon phases, meteor showers, etc… and other interesting events. Events on the calendar are organized by date, times given in Coordinated Universal Time (UTC) must be converted to your local time. Edmund Halley, William Herschel, Harlow Shapley, and Edwin Hubble were born this month. The first photograph of a meteor was taken on November 26, 1885. The minor planet/comet 2060 Chiron or 95P/Chiron was discovered by Charles Kowal on November 1, 1977. The peaks of the minor Southern and Northern Taurid meteor showers take place on November 5th and November 12th respectively. These streams form part of the complex associated with Comet 2P/Encke. Moonlight compromises the peaks of both of the showers. The Leonid meteor shower occurs on the morning of November 17th, with a waning crescent Moon being a minor hindrance. Leonid meteors are debris from the periodic comet 55P/Tempel-Tuttle. Due to their high speed (71 kilometers or 44 miles per second), the Leonids produce a greater percentage of fireballs than most meteor showers. The Moon is 8.1 days old, is 60.2% illuminated, and resides in Aquarius on November 1st at 0:00 UT. The Moon reaches its greatest northern declination on November 9th (+18.6 degrees) and its greatest southern declination on November 24th (-18.6 degrees). Longitudinal libration is at a maximum of +5.5 degrees on November 9th and a minimum of -5.2 degrees on November 21st. Latitudinal libration is at a maximum of +6.8 degrees on November 11th and a minimum of -6.7 degrees on November 25th. The Sun is located in Libra on November 1 at 0:00 UT. Brightness, apparent size, illumination, distance from the Earth in astronomical units, and location data for the planets and Pluto on November 1: Mercury (-0.6, 6.9″, 55% illuminated, 0.97 a.u., Virgo), Venus (magnitude -4.0, 9.7″, 100% illuminated, 1.72 a.u., Libra), Mars (magnitude +0.9, 5.5″, 90% illuminated, 1.69 a.u., Sagittarius), Jupiter (magnitude -2.1, 36.4″, 99% illuminated, 5.42 a.u., Leo), Saturn (magnitude +0.5, 15.3″, 100% illuminated, 10.90 a.u., Libra), Uranus (magnitude +5.7, 3.7″, 100% illuminated, 19.25 a.u. on November 16th, Pisces), Neptune (magnitude +7.9, 2.3″, 100% illuminated, 29.76 a.u. on November 16th, Aquarius), and Pluto (magnitude +14.2, 0.1″, 100% illuminated, 33.41 a.u. on November 16th, Sagittarius). During the evening, Mars is in the southwest, Uranus is in the southeast, and Neptune is in the south. Jupiter lies in the east, Uranus in the southwest, and Neptune in the west at midnight. Mercury is located in the east and Jupiter in the south in the morning sky. At midmonth, Mercury is visible during morning twilight, Mars sets at 8:00 p.m. local time, and Jupiter rises at 11:00 p.m. and transits at 6:00 a.m. local time for observers at latitude 40 degrees north. Mercury undergoes its finest morning apparition of the year for northern hemisphere observers during the first half of the month. 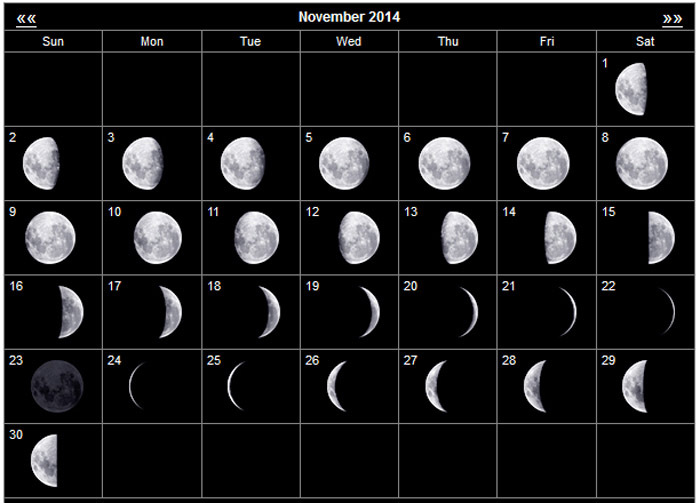 It reaches greatest western elongation on November 1st. The speedy planet is at its greatest heliocentric latitude north on November 5th and the descending node on November 28th. By month’s end, Mercury dims to magnitude -0.9. Venus will not be readily visible again until early December. Mars is located low in the southwest during the early evening this month. It lies 0.6 degree north of the third-magnitude star Lambda Sagittarii (Kaus Borealis) on November 3rd. On that date, Mars is two degrees west-southwest of the bright globular cluster M22 and five degrees east of M8, the Lagoon Nebula. The Red Planet passes 0.8 degree south of M22 on November 6th. It lies seven degrees south of the waxing crescent Moon on November 26th. Mars shrinks to 5.1 arc seconds in apparent size and dims to magnitude +1.0 by end of the month, at which point it is some 20 degrees from Lambda Sagittarii. Jupiter’s apparent diameter increases slightly to 39.7 arc seconds and its brightness to magnitude -2.2 over the course of the month. Jupiter is situated five degrees north of the Moon on November 14th. Saturn sets less than one hour after sunset at the start of the month. The Ringed Planet is 1.5 degrees north of Venus on the evening of November 12th. Saturn is in conjunction with the Sun on November 18th and is not observable again until early December. Uranus is in retrograde in Pisces. The seventh planet is located within one degree of the sixth-magnitude K-type star 96 Piscium throughout November and is closest to it at mid-month. Neptune resumes prograde or direct motion on November 16th. It can be found 0.9 degree west of the fifth-magnitude star Sigma Aquarii during November. Pluto is located 3.7 degrees north of Mars on November 10th. The dwarf planet heads eastward through Sagittarius during November, passing 22 arc minutes south of the fifth-magnitude star 29 Sagittarii on November 19th. Comet C/2013 A1 (Siding Spring) travels northeastward through Ophiuchus and Serpens Cauda this month. This comet faded considerably last month prior to its historic close flyby of Mars on October 19th and may be very difficult to observe. Comet Siding Spring passes just east of the fourth-magnitude star Omicron Serpentis on November 15th.